Just a couple of years ago, the election to replace Jack Weiss in City Council District 5, which includes Westwood, Fairfax, Bel Air, and more was a hot one for Livable Streets advocates. On one hand, you had former West Hollywood Mayor and AIDS Life Cycle participant Paul Koretz against David Vahedi, a lawyer who succesfully sued the City of Los Angeles for dangerous non-maintenance of bike paths. The race came down to a runoff and was close until the end. Koretz won. This time, Koretz faces Mark Herd, a little known opponent who it appears designed his website in 1998. Since this race will mostly be about the incumbent, Streetsblog presents a brief look at his record. More recently, Koretz backed the new Motor Avenue bike lanes that are already providing safer commutes through the western part of his district for hundreds of cyclists a day. While some in the surrounding community grumbled that the lanes created a choke point for car traffic, Koretz stood his ground. Not only is his apointee to the Expo Bicycle Advisory Committee one of the most active and engaged members, his chief transportation deputy Jay Greenstein attends nearly every meeting, the only member of L.A. City government to do so. Koretz’s record on transit projects is perhaps more mixed. When Westwood homeowner groups fought the Wilshire Bus Only Lanes, Koretz and Supervisor Zev Yaroslavsky successfully removed .8 miles from the project. On the Westside Subway, Koretz has aggressively backed the proposed stop at Constellation Boulevard and Avenue of the Stars, the preferred route of Metro’s environmental studies and the bane of Beverly Hills. While it just so happens that many influential constituents back the route, Koretz used ridership numbers from the environmental study to back his position. For his efforts, opponents of the Constellation Boulevard stop tried to tie Koretz to former Councilman Jack Weiss, who’s former field deputy organized a press event backing the stop. One of the largest contributions Koretz made to Livable Streets may have happened before he took office. Both Koretz and Vehedi pledged to fight the “Pico-Olympic Plan” favored by Yaroslavsky and Mayor Antonio Villaraigosa. The plan would have removed parking and used signalization to speed up traffic on Olympic Boulevard going west and Pico Boulevard going east at rush hour, essentially turning the two Boulevards into mini-highays. Weiss was a big supporter of the plan, but the neighboring Council Members, Bill Rosendahl and Herb Wesson opposed the plan. When Koretz and Vahedi announced their opposition as well, it became clear that once Weiss left office all of the City Council Members with parts of their district impacted by the plan would oppose it, essentially making it impossible to pass muster in City Hall. To his credit, Herd backs “safer streets” and has made attacking billboard blight a key issue in his campaign. However, details are still short on much of the candidate’s position on transportation and livability issues. Herd is banking on a “great debate” on February 26 to get his message out. The debate will be held at St. Paul’s Church in Westwood at 7 p.m. I live in Encino section of the San Fernando Valley and thanks to redistricting got Paul Koretz who doesn’t know the Valley exists. I say this as he won’t respond to emails, calls or even contacts via his site. Website says he has a Valley newsletter yet after three requests none have been received. He doesn’t use Twitter or Facebook either so no way to be updated about what’s happening in the area by him. But he can find me to mail a request to give him money for his re-election. How can I get my house back into a real Valley district? You should have attended one of the recent community meetings regarding bike lanes on Westwood Blvd. (Has streetsblog adopted a policy of ignoring Westwood?) You would have seen and heard how Jay Greenstein, still transportation deputy for Koretz, now occasionally backed up by Andy Shrader, channels the politician who leads from behind. Greenstein and Shrader present to the community a Councilmember who has a very acute sense that a bike lane may have IMPACTS on drivers and on parking. But where is the sense that driving and parked cars have IMPACTS of people who ride bikes? Serious, life-threatening impacts. Tooth-shattering and bone cracking impacts. Ignoring those impacts on vulnerable road users has now become official Koretz policy. 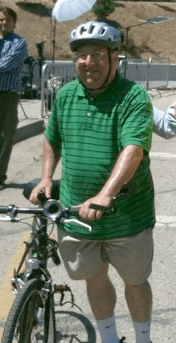 No, this Koretz is not going to stick out his head for any cyclists. The furious leaders of some homeowner associations have trained him very well indeed. On 19 March 2015 this one-sided fear of IMPACTS on car traffic has provided us with a pretty pathetic spectacle: The board of the Westwood Village Business Improvement District voted unanimously for bike lanes in the village. (Almost half of the board even voted in favor of protected bike lanes). This result left the Koretz team in the room stunned, mumbling “no impacts”, “no impacts,” clinging to an outdated and entirely unfair notion of traffic impacts. The local business community has effectively overtaken the politician, who is still wedded to outdated notions of how to manage traffic. Koretz, what have these homeowners whispered into your ear to put you into this awkward position? In Westwood, it is now time to lead from the front. CD 5 Candidates Talk Bikes at Biking in L.A.